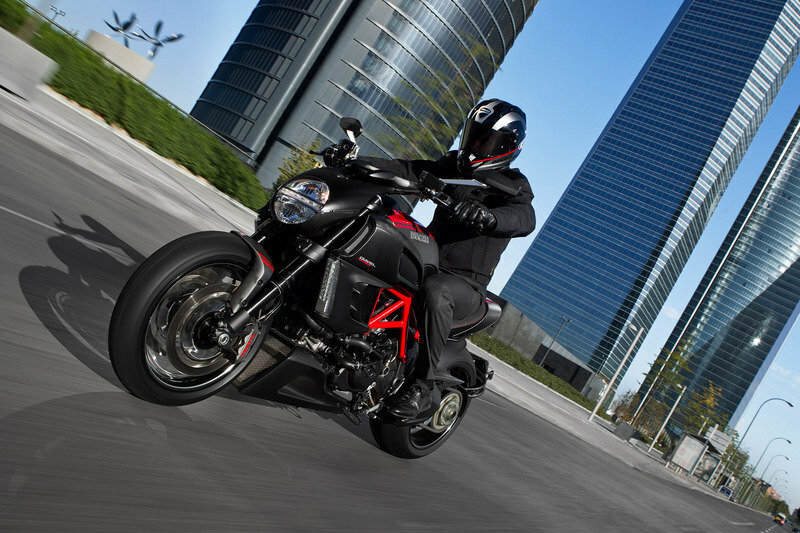 Thanks to its aggressive character, the Ducati Diavel Carbon is seen by many riders as a true “bad boy” among naked bikes. Its iconic red frame, the sharp lines of the body, the black accessories, the dual exhaust and the fat rear tire are all working together to offer a very special visual effect that will make you fall in love with this bike from the first sight. In terms of power this mechanical beast is fitted with a strong 1198 cc, Testastretta 11°, L twin cylinder, 4 valve per cylinder, Desmodromic, liquid cooled engine. Fire it up and you’ll be assaulted by a maximum power of 119 KW (162 Hp) achieved at 9,500 rpm and 127.5 Nm (94 Lb-Ft) of torque available at its peak at 8,000 Rpm. This Italian beauty can be yours for no less than $20,495. 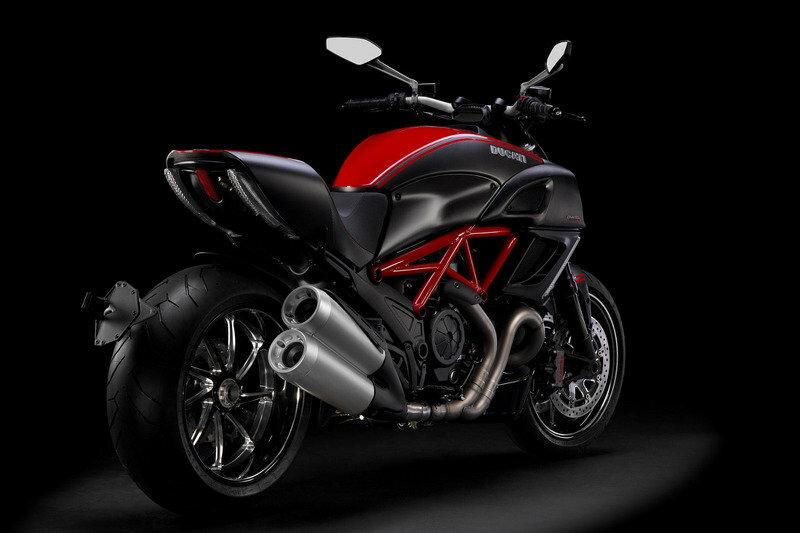 Hit the jump for more information on the 2014 Ducati Diavel Carbon. Machine finished forged aluminium Marchesini wheels, reducing weight to 205 kg. Marzocchi forks with diamond-like coating (DLC). Brake disc carriers in milled aluminium. Carbon fibre fairing and black accessories. All these make the Diavel Carbon a magical meeting point of style and performance. The stance of the Diavel is that of readiness, dominance, and confidence bordering on superiority. 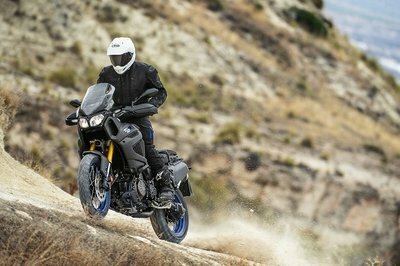 With lateral radiators adding muscle to its broad “shoulders,” which then taper down across the engine and into the belly-fairing with oil cooler, the athlete took shape. A massive 240 section rear tyre was a perfect example of how Diavel designers used a no-compromise attitude when applying their wish list of features. The sheer width of rubber communicates so much power and style that the R&D team vowed to find a way to make it handle - even if they knew the image would send a seismic shock through the industry. The Diavel is a true Ducati, born from a passion for motorcycling and designed to deliver authentic Ducati performance in every respect. The Diavel Carbon embodies the true nature of the Diavel concept, where performance combines with style to celebrate Italian engineering at its best. Lightweight composites and milled aluminium components meld the two worlds of sport and style with features that are both visually beautiful and functionally high-performance. The Diavels heart is the Ducati Testastretta 11° - developed directly from the incredibly powerful, world-beating race engines of Ducati Corse. Ducati’s Testastretta 11° harnesses the immense power of the Superbike engine and makes it smooth and adaptable, a massive step forward in balancing high-performance with an enjoyable ride. For an engine with brute power on tap when needed and smooth, user-friendliness available for an effortless and comfortable ride, Ducati revised the configuration of the cam timing with particular focus on the valve overlap angle. The overlap angle is defined as the interval of crankshaft rotation, measured in degrees, during which both the intake and exhaust valves are open at the same time. This overlap occurs between the end of the exhaust stroke and the start of the intake stroke. High performance engines, which are subject to compromising smoothness for extreme power delivery, use high values of this parameter in order to benefit from the pressure waves to improve engine performance by maximising volumetric efficiency. On the Testastretta 11° engine, this angle has been reduced from 41°, used in the Testastretta Evoluzione engine which powers the 1198, to 11°. As a result, the fresh inlet charge flow is less compromised by the exiting exhaust gases, resulting in a much smoother combustion in addition to improved fuel economy and lower exhaust emissions. Constant investment in quality by design, advanced materials and engineering techniques have enabled the distance between major service intervals (valve clearance check) to be increased to a highly competitive 15,000 miles. This has been achieved with the introduction of new valve seat materials, improved combustion efficiency and temperature management designed into the Testastretta 11° engine. The transmission features an oil bath clutch with “slipper” function and super-light feel at the lever. Its design uses a progressive self-servo mechanism that presses the plates together when under drive from the engine, enabling the reduction of the clutch spring rates. This results in a much lighter clutch lever at the handlebar, ideal in stop-start traffic or during long journeys. When the drive force is reversed (over-run), the same mechanism reduces the pressure on the clutch plates, enabling them to provide a race-like “slipper” action, which reduces the destabilizing effect of the rear-end under aggressive down-shifting and provides a much smoother feeling when closing the throttle or down-shifting under normal riding conditions. 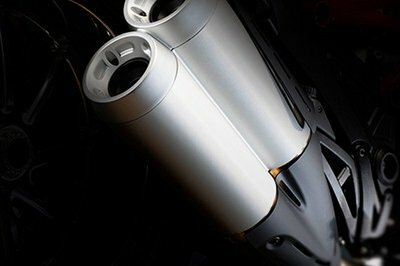 The Diavel uses 50mm Marzocchi front forks with fork sliders black-finished in super low-friction diamond-like carbon (DLC). These forks are fully adjustable for spring pre-load, compression and rebound damping. The forks are gripped by a slash-cut triple-clamp - cast aluminium for the lower and forged for the upper - with a rubber-mounted riser to tapered alloy bars. With a rake of 28°, trail of 130mm (5.12in) and an offset of 24mm (0.945in), the set-up provides a sure-footed and agile front-end for incredible handling and 70° of total steering lock for maximum manoeuvrability. The Diavel’s 17l (4.5 gal US) fuel tank represents an integral part of the bike’s overall styling. 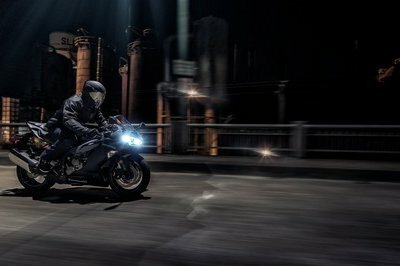 Its wide, long lines sweep down from the headlamp assembly into the seat and rear sub-frame to create a seamless profile. While the focal point of the tank is the high resolution display panel, the steel tank skin and well-sculpted knee panels add a solid feel to the Diavel and a high tech composite look to the Diavel Carbon. On each side of the front of the tank are massive air intakes formed in aluminium to feed the engine’s large airbox. 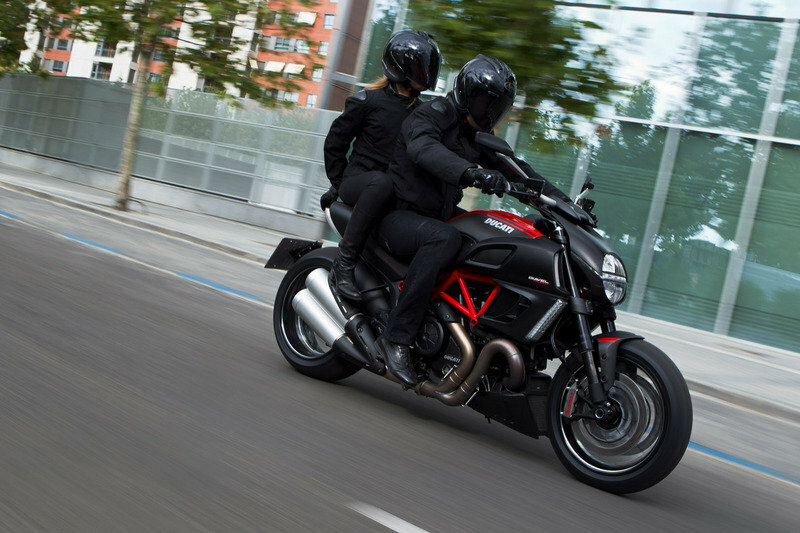 The Diavel’s twin-level seat is wide, comfortable and beautifully shaped to fit the flowing lines of the machine and at 770mm (30.3in), has one of the lowest seat heights in the Ducati range. That low seating position, in addition to a low slung chassis set-up that weighs in at just 210kg (463lb) - 207kg (456lb) for the Diavel Carbon - enables the rider to get both feet on the ground for a sure-footed and confident stance. The seat also comes with a beautifully shaped and easily removable single seat cover, which is formed in carbon fibre on the Diavel Carbon. Carbon fibre is used for the tank panels, single-seat cover and front mudguard to reduce weight and apply a race-like feature that runs deep in the DNA of Ducati. The upper LCD display is mounted on the bar-riser and provides main information such as speed and rpm, in addition to warning lights, time and temperature. The lower, full colour Thin Film Transistor (TFT) display is styled into the fuel tank and provides an incredibly clear account of current Riding Mode, gear selection and DTC setting as well as total mileage and trips. Used on mobile phones and computers, TFT technology is a variant of LCD and displays easy-to-read high resolution graphics. The Diavel’s TFT display goes one step further by using the sensitivity of its surrounding light to decide upon black or white background colour. When stationary, the lower display also doubles as the latest user-friendly control panel to personalise DTC and RbW settings within each Riding Mode before saving. 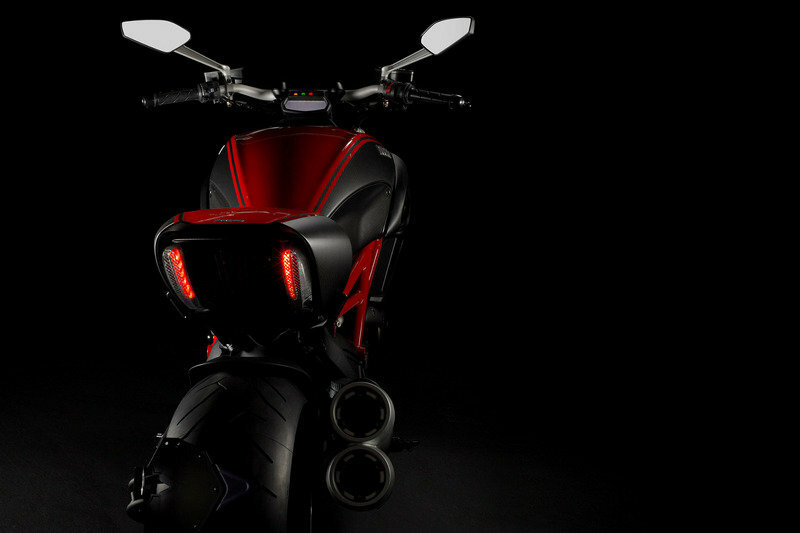 Ducati’s technical partner, Pirelli, worked with the Diavel’s designers and engineers to develop the incredible new Diablo Rosso II tyres. While the front uses a conventional 120/70x17 section with a new tread pattern designed for enhanced wet weather performance, the 240/45x17 rear represents the latest innovation in tyre design with a sport-oriented profile being applied to custom-style width. The massive rear employs bi-compound technology to enable high grip levels at full lean angle while providing high mileage and uses Enhanced Patch Technology (EPT) to maximise the contact patch at all angles. The tread pattern and compounds deliver great performance in all conditions, especially the wet. The Diavel handlebar shape and arrangement leaves the rider feeling comfortable and in command. Wide, tapered section aluminium bars with new custom designed provide a clean and minimalist set-up, while stylish, forged-aluminium supported mirrors deliver a generous view to the rear. Switchgear control is taken care of by Ducati’s latest and most minimalist design with slim-line bodies housing easy-to-use switches and buttons and a unique weapons-like “trigger catch” that slides down to cover the starter button when activating the kill-switch. 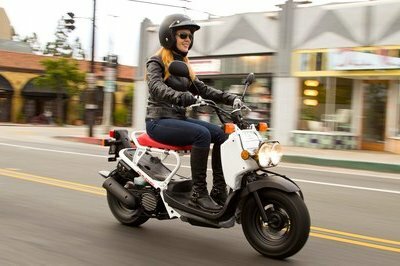 While the indicator cancel button doubles as a scroll-and-select for fast and easy Riding Mode changes, switches above and below serve to navigate the new high-resolution display control panel.